In lieu of my traditional Meaningless Awards of the Week, this week I’m singling out one man for his contributions to comics as of late. No one has done more to influence my love comics in the past five years than the current Marvel editor-in-chief, Joe Quesada. And for that, I’m not only presenting him this distinguished award, but naming it after him as well. Aunt May’s death in last Wednesday’s Amazing Spider-Man #538 was surely one of the most devastating moments in Peter’s life. As a lifelong reader of Spider-Man comics, I should have been devastated as well. For years now, Joe Quesada has used every opportunity at his disposable to talk about how much he hates the marriage between Peter and Mary Jane. According to him, it’s the worst thing that’s ever happened to the Spider-Man. According to him, a married Spider-Man limits the story possibilities for the character and makes him less accessible to readers. On numerous occasions he’s said that he wished there was someway to undo the marriage. Simply put, Joe Quesada wanted Mary Jane out of the picture. Then came Civil War. Spider-Man revealed his secret identity to the world and automatically his family became targets of anyone with a grudge against Spidey. Then came the announcement that Spider-Man would be returning to his black costume while he mourns the death of someone close to him. 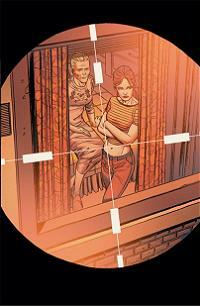 Then came Amazing Spider-Man #537, which ended on a splash page of Mary Jane in the sights of a sniper rifle. At that point, I’d given up hope. Joe Quesada was going to kill Mary Jane, that’s that. So as I was reading Amazing Spider-Man #538, I had no doubt in my mind that it’s the last story I’ll read with Mary Jane in it. The most important supporting character since I’ve been reading Spider-Man stories was going to die. Then she didn’t, and a wave of relief rushed over me. Mary Jane didn’t die! Woo hoo! Then I realized that I was so relieved that Mary Jane wasn’t dead, that I simply didn’t care that Aunt May was dead. 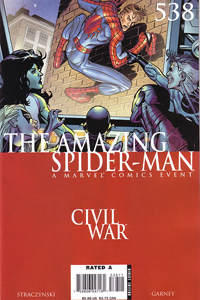 But Aunt May’s death should have been a tragic event for any long time reader. For Peter Parker’s entire life, there was one person that always stood by him no matter what, ready to force feed him wheat cakes or set him up with their next door neighbor’s niece. Few people were as positive an influence on Peter’s life as May Parker. Without her tireless love and support, Peter simply wouldn’t be the man he is today. And now, his “mother” was dead, simply because he was Spider-Man and he chose to reveal his identity to the world during Civil War. Aunt May’s death should have been heartbreaking. But thanks to Joe Quesada’s years of threatening to do away with another beloved character, it wasn’t. That’s the Joe Quesada difference! In addition to The Death of Aunt May, Joe Quesada is receiving this award for his work with Avengers: Disassembled, House of M, Spider-Man: The Other, Civil War and most likely World War Hulk. Wow, Joe Quesada successfully contributed to throwing up the smokescreen for that red herring…and for being 100% successful at making the surprise a surprise, he gets ripped! Joe Quesada made the surpise “Will Mary Jane die?” instead of “Will Mary Jane or Aunt May die?” So when Aunt May died, it wasn’t a surprise. It was a consequence of Mary Jane not dying, which I guess is a surprise, but not the one that should have been surprising. But it’s not even a matter of it being a surprise. I should care that Aunt May died. Aunt May is a very important character. Her death should mean something. It shouldn’t be overshadowed by another character not dying. Well don’t blame Joe Quesada that you care more about Mary Jane than Aunt May. I don’t think I do care more about Mary Jane than Aunt May. But I didn’t have every reason to think Aunt May was going to die, so I wasn’t as invested in her dying or not dying. Joe Quesada made Mary Jane more important by focusing on her for so long. The last time Aunt May died, (ASM #400), was actually quite moving – the only good story, in fact, out of that whole Clone Saga nonsense. This story seemed a lot more random. Random things tend to happen when you gotta find a reason for Spidey to wear the Venom costume. She’s not dead yet, we have her for atleast another 4 months till Joey Q gets to his arc on the Spider-Man books. I wasn’t shocked wth the death. Joe has got to the point that if he hypes something, expect the opposite not to happen.